There is only one thing better than attracting a lot of people to your website and that is converting those viewers into buyers. Conversion Rate Optimisation (CRO) is the process of analysing the web visitor‚s behaviour and interaction and then improving the structure of your site to ensure that you have the right layout, information & support to enable your buyers purchase easily and instantly. 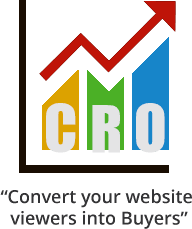 If we work with a website that has never had any CRO work performed it is not unusual to increase conversions by 200 -300 percent. Simply due to our research, knowledge and extensive experience can we understand what works and what does not work, so now you do not have to waste time and money on excessive trial and error. Test the size and capacity of your current traffic to ensure the performance you require has the resources to meet your sales criteria. Analyse your site and track customer behaviour to determine the positive and negative buyer activities that create and dissuade purchases. Design, develop, test and report all changes in every stage of the improvement process. Project Manage the process with your team to ensure we work within business guidelines. Work with you on your product offer/s to ensure that you gain maximum performance. Test marketing offers in suitable batch sizes and provide feedback and recommendations to increase conversion rates. There is no contract length on this work and CRO compliments PPC and SEO activities because it converts the sale once you have attracted your customers to the site. Our developers continually monitor your site and that is provided within the quoted fee. There is no guarantee of conversion rates because that also depends on how you package your product offerings and other factors beyond our control. Regardless of the increase in conversations you will also be provided with a deep insight into your sources of traffic, current visitors, marketplace and the current hidden wealth in your business as well as design work. Which is all your to keep. If you call us we will come out and have an obligation free chat about your business and give you an honest appraisal of what we feel we can or cannot do for you. We guarantee we won‚t recommend anything that we don‚t believe will work for you.